Annalong, Newry, Co. Down, Northern Ireland. If you want to travel by coach in award winning style, then you need look no further than Classic Coaches (County Down) based in the picturesque old fishing village of Annalong on the coast of Co. Down, right in the heart of the beautiful Kingdom of Mourne. At Classic Coaches, we pride ourselves in offering our customers a polished and professional travel service, while maintaining the traditional values and personal attention you would expect from an established family business. Our staff are efficient, but also extremely pleasant and helpful because we want you to be able to relax and enjoy your well earned break in comfort. Our Fully inclusive Tour Service. 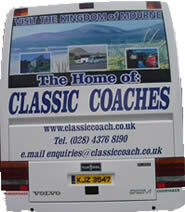 Classic Coaches go that step further and offer a fully inclusive travel planning service. From the moment you arrive in Ireland we can arrange your full itinerary including transport, accommodation, access to sporting, cultural and historic events and venues - whatever you would like to do we can organise it, take your there and bring you back again, no matter what the numbers. We can even do your airport transfers from Belfast City, Belfast International and Dublin Airports as well as the ferry terminals. 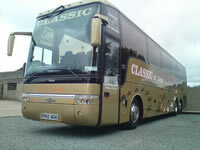 The whole holiday and trip service from Classic Coaches. Simply safe… the way to go!